(Newser) – Mei Xiang, the giant panda at Washington's National Zoo who lost her cub yesterday, "was a good mom who protected her cub and did not crush her," says the zoo’s chief veterinarian today. Preliminary necropsy findings did not reveal a cause of death, but did indicate that the tiny 6-day-old cub, a girl, had excess fluid in her abdomen and that parts of her liver were hard or had strange coloring, ABC News reports. She appeared to have been nursing successfully before her death. Additional tests could identify a cause of death within a week, the Washington Post adds. Mei Xiang seems to be coping, but is cradling a toy in place of her cub, which indicates she still sees herself as a mother. 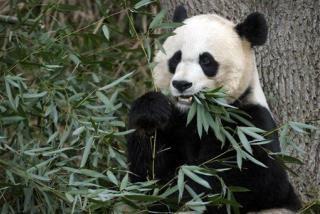 As for the cub's father, Tian Tian is "blissfully unaware" of the death, the chief vet says.